SINGAPORE - Floating in the oceans today are 26 time capsules from Singapore, lost in 1974 after being released off Raffles Lighthouse for a research project on tides and currents. Each 43-year-old capsule literally contains time: a Citizen Blackie watch or coupon to redeem the same. A watch that could have been in one of these time capsules is on display at the Toa Payoh Public Library. Until Nov 29, the library hosts Frozen In Time: Time Capsules In Singapore, an exhibition summarising two centuries of Singapore's history through its time capsules. Over 50 capsules have been created in Singapore over the past 200 years. The exhibition is produced by the National Heritage Board (NHB) and will be hosted in turn by seven other libraries over the next 12 months. It features 40 objects of the same age and make as those buried in local time capsules. None of the displayed objects are, however, recovered from existing capsules. Visitors looking at some of the objects on display as part of National Heritage Board's new exhibition of time capsules, Frozen in Time, at the Toa Payoh Public Library on Nov 9, 2017. 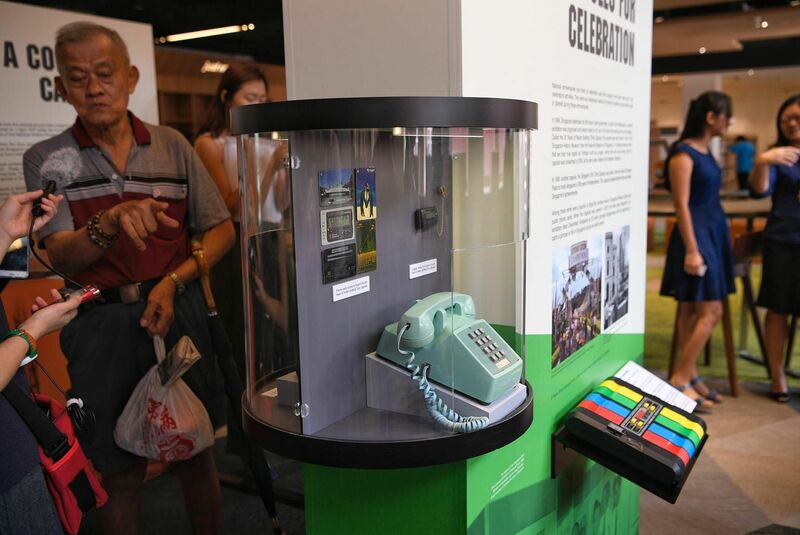 The display includes coins no longer in circulation, books, and devices that would have been on the cutting-edge of technology at the time, such as an electronic memory game or a pager. Visitors can handle or play with some of the objects and make their own time capsules out of paper models. The curator in charge is Ms Ruchi Mittal, assistant manager, education and community outreach, at NHB. She started research for this exhibition last year, after a time capsule from 1843 was excavated by workers restoring Cathedral of the Good Shepherd along Queen Street. Ms Mittal, 24, was intrigued by the idea and contents of time capsules older than she is. 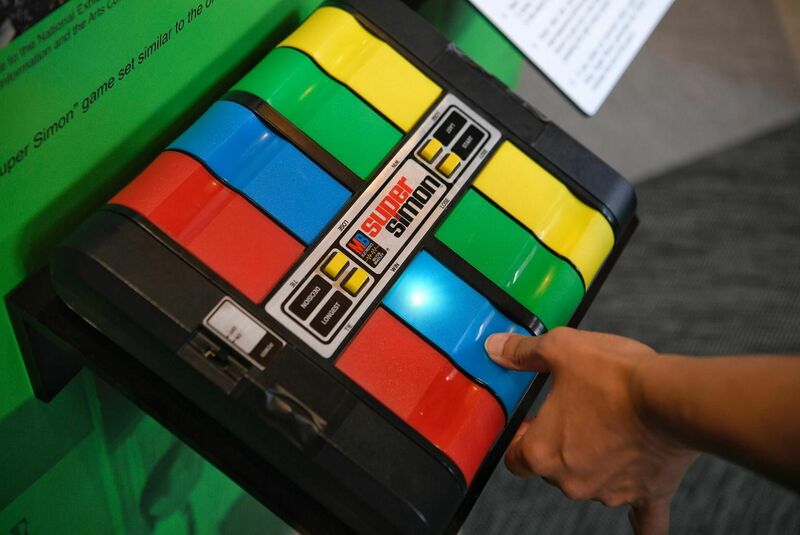 At the exhibition, she demonstrates electronic memory game Super Simon, similar to one in a capsule buried in 1984 in front of the National Museum (then the Singapore History Museum). The game emits an ever-longer sequence of musical notes which visitors have to mimic by pressing on coloured keys. "This was the height of technology at the time," she says. 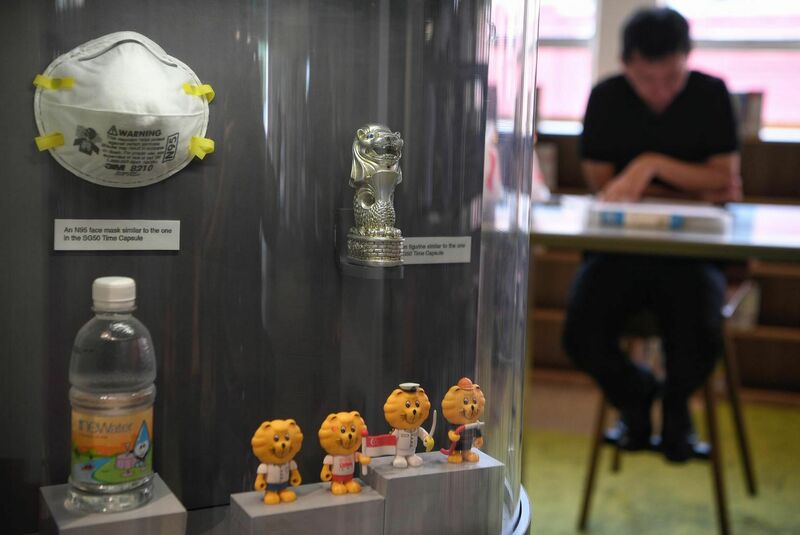 Several items similar to those placed inside the SG50 Time Capsule on display as part of National Heritage Board's new exhibition of time capsules, Frozen in Time, at the Toa Payoh Public Library on Nov 9, 2017. Time capsules are "dormant mini-museums" which provide insight into Singapore's past, says Mr Alvin Tan, assistant chief executive, policy and community, at NHB. NHB is launching a larger virtual time capsule gallery on Nov 10 on www.roots.sg/frozen-in-time. The virtual gallery offers a 360-degree view of the exhibition, with links to more than 100 objects from time capsules and the stories behind the capsules. Retiree Cheng Tiam Meng, 80, was drawn to the old objects on display at the library. He examined old coins from the Straits Settlements era. Similar coins are buried under the foundation stone of the former Supreme Court, now the National Gallery Singapore, in a time capsule scheduled to be opened in the year 3000. "One cent now has no value but at that time, with two or three cents you could go to the market and buy vegetables. Even five cents today, people are not interested in," says Mr Cheng, a frequent visitor of the Toa Payoh Public Library as it is near his home. Ms Carmen Tan, a secondary three student at CHIJ Toa Payoh, was impressed by a landline phone with push buttons. "There are things we don't see often," the 15-year-old said. Her schoolmate Nadia Lim, also 15, said: "Some objects were even excavated before I was born." She was struck by a bulky HP-35 scientific calculator very different from the calculator app found on smartphones today. A similar calculator is inside a time capsule buried in 1973 by the Science Centre Singapore. The capsule has been opened and sealed again several times from 1993 to 2013, with new objects added to represent evolving technology. It will next be opened in 2027. Another time capsule scheduled to be opened in 2027 was buried by Singapore Press Holdings in 2002, to mark its new corporate headquarters in Toa Payoh North. The exhibition also represents lost time capsules such as the floating capsules from 1974. Watches and coupons were put in the capsules to encourage people to retrieve the objects and submit data on where the capsules were found. Fifty capsules were released and only 24 recovered, within two months of the launch date. The most famous missing capsule dates to 1970 and was buried under the former National Stadium. In 2010, a $50,000 reward was offered to anyone who found the capsule, but to date, it has not been uncovered. Info: The exhibit will be shown at different libraries around Singapore until Nov 29 next year. It moves to Queenstown Public Library from Dec 1 to 30. View the time capsule gallery at www.roots.sg/frozen-in-time from Nov 10. Correction note: An earlier version of the article said that the virtual gallery will offer a 360-degree view of more than 100 objects from time capsules and the stories behind the capsules. This is incorrect. We are sorry for the error.